Making your own vinegar is a simple and cost efficient skill to learn, practice, and perfect. It is an old-school skill that would benefit you now and in an emergency. If store shelves become barren, and you have access to fresh fruits and even vegetables, this is a staple that you can continue to make even if society comes to a grinding halt. I’m not discouraging Survival Moms from buying gallons of white vinegar from your local stores, but save it to clean your windows and pickle your cucumbers. Use your homemade vinegar to add the “Wow!” factor to your fresh recipes! There are also health benefits to homemade vinegar. It has long been used in the homeopathic community. Many swear by its antibacterial and antifungal properties. Making your own vinegar is fairly simple and straight forward. I found several sites with varying steps. Distilled water. Chemicals in tap water will interfere with the process. A warm, dark place to store the vinegar while it is “working”. 1. Sterilize the container by filling it with boiling water and letting it stand for 5 minutes. Pour the water out. 3. Place the juice, cores, or peels in the container and cover with distilled water. Secure the cheesecloth or towel over the lid so that insects and dirt can’t get inside. The cloth allows the natural bacteria and wild yeast in the air to colonize in the vinegar, which in turn causes it to ferment. Some people add wine or beer yeast (not baking yeast) to their batch to encourage fermentation. This is a personal choice and does not appear to be necessary. 4. Store the container in a dark area between 60 and 80 degrees F. Gently stir once a day to make sure that the ferment is mixing with the rest of the liquid. After a few weeks you will start noticing a vinegary odor. Allow the vinegar to continue to ferment until you have the intensity that you want. This process should take 3 – 4 weeks. Near the end, feel free to begin tasting to find the flavor you desire. The mother of vinegar is the slimy, gummy, jelly-like substance or layer of film that can form on the top or bottom of your vinegar. It can sometimes make the vinegar look cloudy. It is the mother that gives the vinegar its characteristic sourness. 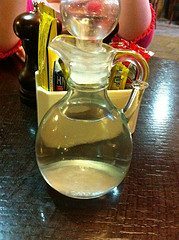 Mother of vinegar can be easily filtered out using cheesecloth or a coffee filter. The mother can then be discarded OR saved and used to create your next batch. To ensure success, especially for your first time, before it is fermented, you can add a half a cup of organic unfiltered vinegar from the health-food store, or use a vinegar starter or mother available on the internet. At this point you can strain through clean cheesecloth and bottle. Store your containers in a cool, dark place. This homemade vinegar can be used as any other vinegar. Each ingredient you use will cause it to have a different flavor. For example we all know what apple cider vinegar tastes like, but peach vinegar has a much different taste, fruitier and mellower. Experiment with different combinations and ingredients to see which you like the best. If you want to store homemade vinegar at room temperature for more than a few months, you must pasteurize it. Do this by heating it to 170 degrees F. Use a cooking thermometer to determine the temperature and hold it at this temperature for 10 minutes. Put the pasteurized vinegar in sterilized containers with tight-fitting lids, out of direct sunlight. The acidity of homemade vinegar varies greatly. If you make your own vinegar, do not use it for canning, preserving, or for anything that will be stored at room temperature. The vinegar’s acidity, or pH level, may not be sufficient to preserve your food and could result in severe food poisoning. The pH level in homemade vinegar can weaken and allow pathogens, such as the deadly E. coli to grow. Homemade vinegar is well suited for dressings, marinades, cooking, or pickled products that are stored in the refrigerator at all times. You can experiment with herbs, fruits, and vegetables to get different flavors of vinegar. This page provides a list of items that work well. 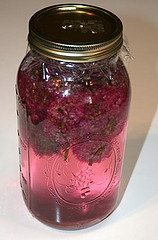 Place your herbs or fruits in a sterilized jar. Pour your vinegar into the jar and fill to within one half an inch of the top. Cover with plastic wrap and then a tight top, if using metal. Let the flavors blend for six weeks in a cool, dark place. Strain and re-bottle making sure you label your yummy new flavors! Caution: You should never leave these items in the vinegar. They will cause the vinegar to spoil. If you’re like me, you’re a visual learner. Here are two videos made by Super Mom. She did not post her third and final phase, but the first two videos are very informative. As I stated earlier, there are slight variations in making homemade vinegar. Her process is worth viewing. Excellent article! Vinegar is one excellent way of preserving. I’m going to assume that you want the pieces you put in the water to not be parts that were in contact with the human mouth? If you are using apple cores and skins should they be cut out instead of eaten? My son eats dozens of apples a week and I’m constantly throwing away his cores but if I could use them for this purpose it would be great! But I don’t want to ruin the vinegar with transferred bacteria from his mouth. What a great skill! I was just thinking about stocking up on lots of white vinegar, so I will use this opportunity to make my own. Thank you for the post!